The High Coast and the Kvarken Archipelago are outstanding examples of glaciation processes. Both sites, on either side of the Gulf of Bothnia, hold numerous islands and islets. The High Coast is important for research on isostacy, in which the land rises as the weight of the glaciers melts off of it. This phenomenon was first recognised and studied here. Kvarken features unusual ridged washboard moraines, "De Greer moraines", formed by the melting of the continental ice sheet, 10,000 to 24,000 years ago. 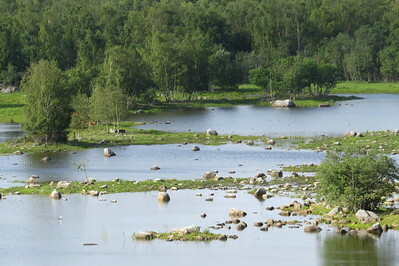 The Kvarken Archipelago is easily accessed nowadays because of the over 1 km long Replot bridge that was built in 1997. It connects the islands of Replot and Björkö with the Finnish West Coast, near the city of Vaasa. Replot and Björkö are two of the largest islands in the archipelago, large enough to hold a couple of villages and summer houses. I stayed overnight in Vaasa and visited the Terranova ecomuseum there for an introduction to the story of this area. It’s only a small exhibition, but provides good insight in what it is all about (such as explaining the isostatic rebound). The next morning I drove to Svedjehamn on the island of Björkö. This is about as far as you can go into the core zone with a car. Svedjehamm is a small fishing town, and has some tourist facilities. I had choosen it for its hiking trails. At 8.45 my car was the first at the car park, and I set off for the “Bodvattnet Runt” combined with a detour to “Langgrundet”. All routes are clearly marked, and it isn’t easy to loose your way anyway as there are few turns. One of the highlights of this walk is right at the beginning, only 800m from the car park. Climbing the Saltkaret Observation Tower rewards one with excellent views of the many long reefs and small islands that have developed just off the coastline. You need to be at some height to be able to see this clearly – it is much less spectacular seen from ground level. I walked on happily, the sun was out already and I still had not seen any other human beings. The only noise came from the plentiful birds, mostly the screaming of seagulls of course, a sound so well known in Holland too. The extension to “Langgrundet” took me through a “forest” of young trees, where the ground was covered with peat and lots of awkward stones. It ended at a picknick spot where you can walk up to the shore. From here I saw how shallow the water really is. 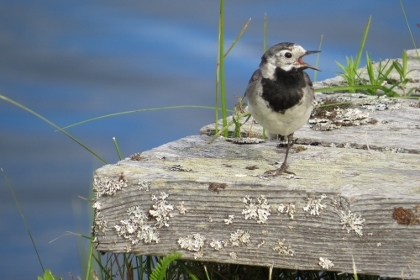 The final half of the “Bodvattnet Runt” walk is another highlight, as it runs along a pretty bay where many birds have settled. I saw a couple of swans with two young ones floating around. At the end there are also some old wooden sheds that were used by local fishermen. Although this hike was only about 8km long, it took me 3 hours to complete due to the sometimes difficult, rocky terrain and the many distractions and photo opportunities along the way. In all, a well recommended hike in a pretty natural setting. I visited this WHS in June 2018. I actually visited the High Coast, the Swedish component of this transnational WHS, over 3 full days. I used Sandöverken as my base and covered most ground by rental car, stopping at different viewpoints and choosing a variety of hikes and trails to explore different aspects of this WHS. To get a good overview and in-depth information on this WHS, I started by visiting the Naturum Hoga Kusten Visitor Centre in Docksta which is free (another good information point is at the High Coast Hotel reception by Sweden's longest suspension bridge). From here you can get lots of information on different trails, hikes and vantage point and they also have the UNESCO WH certificate on display. If you're adventurous and not afraid of heights, from here you can go abseiling up the Via Ferrata on Skuleberget which is one of the inscribed components of the High Coast. If this is not your thing, you'll be better off opting for the chair lift (FriluftsByn) up to a panoramic viewpoint to the Top Cabin serving ice cold Hoga Kusten beer. If you choose the latter, you can follow short hikes (O. Bergstigen and Kalottstigen) to see different viewpoints, flora and the world's highest coastline at 286 metres above sea level. 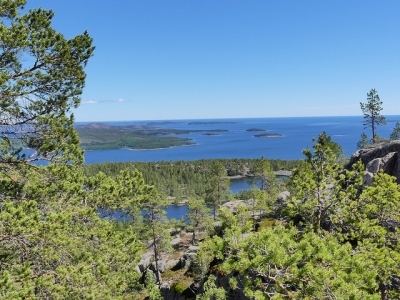 The High Coast, together with the Kvarken Archipelago in Finland) has been inscribed for its geological OUV. Nowhere else in the world has the land uplift been so extensive after the latest ice age as here. Since the ice sheet retreated from this area around 9600 years ago, the land has risen 286 metres. Land uplift has been 800 metres in total over the last 18,000 years, while the current uplift is 8mm per year. The yellow signs marked as Varldsarvsleden are the WH listed trails you need to follow and which lead to different geological aspects of this WHS. The best place to easily view a good example of how the sea and land uplift have formed the landscape after the latest ice age is the Ringkallen peak in Sorleviken. There are different UNESCO information boards that give you detailed information and you can reach this point easily by car too. 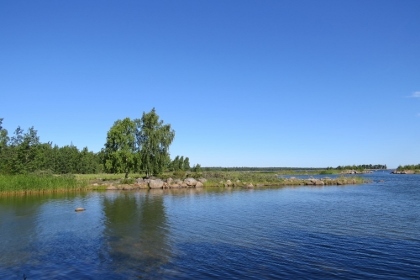 The High Coast is characterised by a varied landscape with long narrow bays, several lakes and small farms (most of which are in falun red) forming a mosaic between high hills. 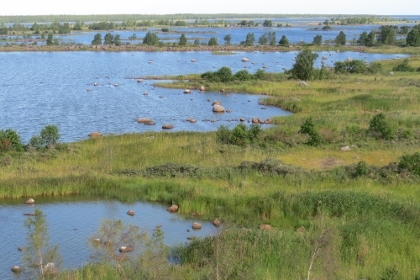 On the other hand, if you'd like to explore the geological features by the current coastline you can opt to visit either Rotsiden (only 500 metres away from the parking lot), a low-lying shoreline with flat smoothened diabase rocks and small islands in the Gulf of Bothnia horizon (two of which, Ulvon and Hogbonden are heritage listed and reachable by ferry), where its relatively easy to spot the white vulnerable flowers of the Northern Rock-cress, or else the Nordingra pinkish granite coastline at the Norrfallsviken Nature Reserve. Here you only have to go for 2.2km hike along the blue trail behind the mini golf cabin (in summer) which leads you to Fornminnen, Nasamyra and Badamalen. Here you'll be able to see one of the lower stone fields which consists of rocks and boulders which were embedded in the ice sheet. Over time, the sea shaped and polished the rocks into roundish rocks with smooth surfaces. While driving towards the highlight of my visit, the Skuleskogens National Park (thanks to Peter Loov for his tips), I also managed to spot a pair of common cranes and whooper swans. I drove around 7km on an unpaved road (with a non-4WD car) to the South Entrance of the park. I opted for a 9.7km trail which starts on a wooden boardwalk in the forest and continues on a strenuous rocky surface to get to the iconic Slattdalsskrevan, a 200 metre long, 7 metre wide and 30 metre deep crevice or chasm. It is very easy to spot several ferns here. Do not forget to head left once you arrive here to go on top of the crevice for spectacular views of the high coast with flat rock pine trees, lakes and rock islands (photo). On the way you'll also see huge cobble fields with bright lime lichens some 150 metres above sea level. The world's highest cobble field can be seen at Hogklinten in Mjallom at a whopping 260 metres above sea level. Overall this was one of the most enjoyable places in Sweden and is mostly visited by locals all year round. If you love trying different foodstuffs, go ahead and try out the fermented Baltic Sea herring, surstromming, which stinks so much that most restaurants that serve it will only serve it outdoors, and Hernö's High Coast Terroir Gin. I travelled down the High Coast of Sweden using the services of the #100 bus, from Ornskoldsvik, past Skuleberget, Docksta and Ullanger to Harnosand. But the highlight was going from Ornskoldsvik to Kopmanholmen by bus (#421), then cruising on the MF Ulvon to Trysunda, and to Fjaren and Ulvohamn on North Ulvon Island. The effect of the raising of the land is quite pronounced around the waterfronts of these small ports. 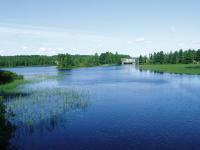 I cruised the Kvarken Archipelago aboard the mv Tirra and went ashore for lunch on Kuusisaari Island. This was a day long cruise from Vaasa's inner harbour costing 11 euros. A very nice place. Don't miss the smal fishing village, the mannamine museum and the Krevassen! From "Kvarken Archipelago / High Coast" to "High Coast / Kvarken Archipelago"
From "High Coast" to "Kvarken Archipelago / High Coast, Finland and Sweden"
High Coast: Bureau - better doc of marine aspects. Also consideration of a "Cultural Landscape". Archipelagos: (Land Elevation) "consists of 7000 skerries and islets. The land rises by 8-8,5 mm annually and creates about 1 km2 new land every year. With this rate the land uplift will create a permanent gateway over the Kvarken in about 2500 years." Nudist beaches: Storsands Nature Reserve on the Mjallom Peninsula near Norrfällsviken on Sweden's "High Coast".